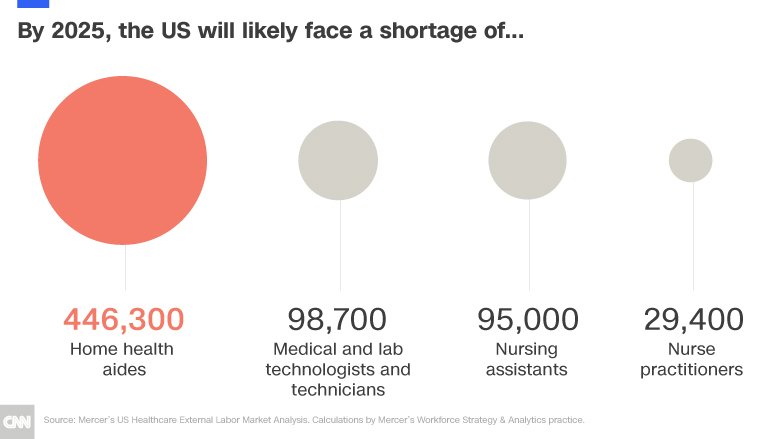 But a persistent shortage of skilled workers -- from nurses to physicians to lab technicians -- will mean hundreds of thousands of positions will remain unfilled, according to research by global health care staffing consultancy Mercer. "Few other industries are racing the clock to find a future-ready workforce like today's health care administrators," said Jason Narlock, senior consultant with Mercer. The largest number of new job openings -- about 423,200 -- will be for home health aides, the report found. Becoming a home health aide requires less education and training than other health care jobs. Typically, an entry-level position requires a high school diploma, for example. However, aides don't earn much, with median pay of about $11 an hour, or $23,130 a year, according to the Labor Department. That low pay makes it hard to attract new talent to the field. And with more workers retiring, Mercer projects there will be a shortage of 446,300 home health aides by 2025. Nurses will also be in hot demand. Mercer estimated that there will be 400,000 new nursing assistant positions and nearly 51,500 new nurse practitioner openings, but there will not be nearly enough skilled workers to fill those roles. Not only are experienced nurses retiring at a rapid clip, but there aren't enough new graduates to replenish the workforce. Hospitals and other medical facilities are getting so desperate to recruit and retain nurses they're offering pricey perks and incentives, including five figure signing bonuses. "When there are fewer nurses available to handle a bigger volume of patients, it adversely affects patient outcomes because of nursing burnout," said Narlock. "Patients are more likely to be readmitted after 30 days of first being seen. They can also be at a higher risk of a hospital acquired infection." The cascading effect of this is seen down the chain. "When patients are readmitted, it puts more pressure on physicians who are already handling a heavy patient load," he said. Physicians and surgeons are already stretched thin. But by 2025, there will be nearly 103,000 new openings for these positions and a shortage of 11,000 skilled professionals for these roles. Elsewhere, Mercer found that medical and clinical lab technicians and technologists will see more than 110,000 new job openings by 2025, but face a shortage of nearly 98,000 trained professionals. A shortage of lab technicians can cause treatment delays. "It creates a backlog to process lab and other diagnostic tests," said Narlock. 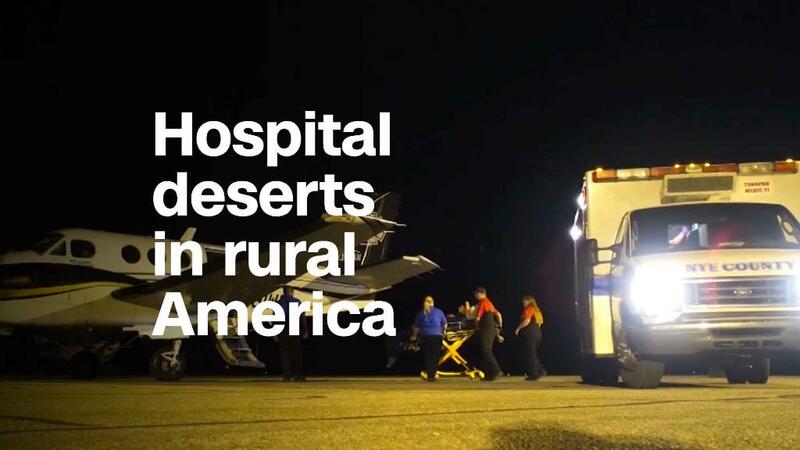 He said health care worker shortages are more pronounced in rural areas, where it's historically been harder to recruit doctors and nurses. Narlock said health care systems have to be innovative in order to address the labor imbalance. "Look at an industry that has faced disruptions where there is an available labor pool that can be retrained to fill these positions," he suggested. In Ohio, for example, one health care system retrained workers who had lost manufacturing jobs to fill jobs as diagnostic technicians. "These workers already had some skills that prepared them for this training," he said. Retail is another area where ongoing layoffs could provide available labor. "In local economies, the retail industry could present one of the largest pools of labor for health care systems to effectively retain workers for jobs such as home health aides," he said.